stimulate their innate powers of healing. Gene composed and performed each piece himself, utilizing unique combinations of over 60 different instruments, specific sounds, keys and notes corresponding to specific emotions, the chakra system and auric fields surrounding the body, which, when clogged, impede the body’s natural defenses. This is not intended to be a relaxation CD but when listening in a relaxed state, with the intention of unblocking and clearing these areas, the contents have shown the potential to bring the listener from the depths of despair to realizing feelings of relief, hope, joy and love. As this was being channeled to me I was told that if a person listens to this CD every day for a month, something magical will happen. Please try it and let me know what you experience. 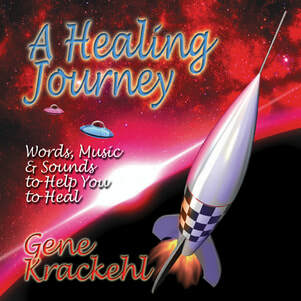 Gene Krackehl is an acclaimed Energy Healer with impeccable credentials. Author of You Are the Healer, he knows his stuff in that weird, unfathomably deep way of those who are called to the craft. He's the real deal, and you can feel it in his every syllable. Thus it is no surprise that benevolent magic hangs all over the proceedings in his CD, A Healing Journey. It's Krackehl's gift to the world, a beautiful mix of sound and words, perfectly pitched to open chakras and heal long-hidden wounds of the psyche and soul. "Change is inevitable, and you've reached a crossroads in your life," says Krackehl. He has you visualize sitting on a mountaintop, looking out at "the vast expanse of your life." He rolls over each word with a loving, measured voice, as if he's got an ace hypnotist buried in the deliberate rhythms of his cadences. Musical touches range from an opening trumpet call, cycling piano chords, thunderous didgeridoo and tribal drums, string-instrument wafts, sudden stabs of synthesizer, and the ambient sounds of nature. At times things can sound almost classical. Tracks alternate between sounds and vocal guidance. "Identify those threatening feelings that surround you; see them from a new perspective," says Krackehl. In the distance is the faint peal of thunder and an acidly winding and uncoiling synthesizer note. Winding surf and faint peals of thunder and gradually burly horn sections and church organs come in always with spine-activating buzzing. Krackehl's music is all the more precious for being so simple and elegant, and his judicious use of vocal commands makes this fine for when you're relaxing or doing chores instead of deep, guided meditation (though this is fine for that as well). Tracks, like the amazing "A Better Place," are beautiful illustrations of when art (as in the casually brilliant piano melodics that coincide suddenly with sitar, for example), function (the buzzing, spinal column-awakening sound), and purity of intent all meet. As, under Krackehl's instruction, you "illuminate" the threats for your "immune system to target later," you realize that what physics proves and what the spiritual teachers say is totally feasible: We can create changes to our bodily systems at the smallest levels through visualization and intent. You can feel the truth of it in the simple but effective magic on A Healing Journey, and the best part is you can take it as many times per day as you want.